According to wikipedia, the Greenhouse Effect "is a process by which thermal radiation from a planetary surface is absorbed by atmospheric greenhouse gases, and is re-radiated in all directions".The four main gases being emitted are water vapor, carbon dioxide, methane, and nitrous oxide. This effect is said to be the reason for Global Warming. The warming of the atmosphere is caused by the greenhouse gases that are released by the populants of the earth. What conditions cause the warming of the atmosphere? The soil started out at room temperature. After it was heated for five minutes, the temperature rose more for the cup covered with aluminum than the others. The one open cup did not change at all. 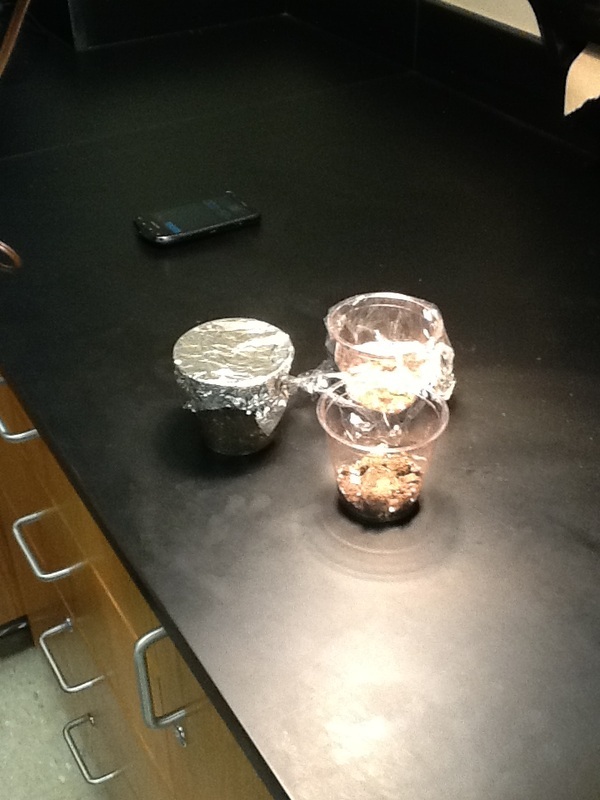 The results supported the hypothesis by heating the aluminum foil more than the others. Why? The earth is covered with a thick layer called the atmosphere, and when gases are emitted up into it, and the sun bears down on it, the gases get hot, therefore heating up the atmosphere. This is called Global Warming and it is an epidemic spread across the world. The lab could be improved through the length of time the cups were heated. Perhaps the numbers would have been greater if the lamp was on for ten minutes rather than five. It would have been interesting to see if time would effect the temperature of the lamp being on. Also, in the future, different soil could be used, or different cups. Maybe even different coverings. This experiment helped to understand the way the atmosphere is heated and how mankind needs to help the ozone out. It is bad for the environment for the atmosphere to get so hot; greenhouse gas emissions need to be limited and regulated. The experiment could also help other people to be aware of what damage we are causing. Most people do not know and it is important to get the word out that greenhouse gas emissions are slowly killing the planet.